When this sweet couple from Oklahoma told us they wanted western-inspired, super rustic details for their elopement, we were thrilled! You'd think a rustic venue like The Barn would have lots of western, ranch-styled weddings, but that really isn't the case. 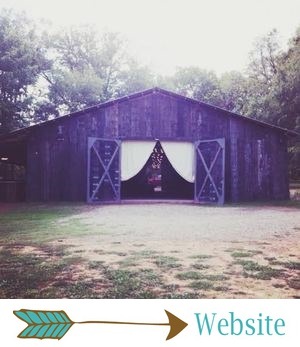 We pulled out allll the hay bales, horseshoes, tooled leather details, burlap, pallets, cotton bolls, shotgun shell boutonnieres... ALL the necessary items for a true ranch-styled wedding! Kelly Glaze Photography captured every detail from this wedding so perfectly... she is quickly becoming one of our faves! Morgan and Hadley were married at The Barn at Twin Oaks Ranch on June 28, 2018. Their western, ranch-styled theme fit flawlessly with our rustic venue and its surroundings. Their color palette was a gorgeous combination of blush, navy, mauve and champagne. "We didn’t really have a plan for the color scheme, it just kind of worked out with what looked best on the bridesmaids and groomsmen," Morgan said. "We truly wanted everyone to feel comfortable on our special day." Easygoing brides like Morgan are the best! Morgan's bouquets and florals were ridiculously good, y'all. "Lesleigh did a PHENOMENAL job on the bouquets," she said. "I was absolutely blown away by all of the detail she put into them." They were full of pink and mauve peonies and roses, a little bit of blue thistle, touches of greenery, and a handful of cotton bolls, which really made these bouquets over-the-top amazing. "I had a sweet friend of mine, Shaylee Wallace, hand tool a bouquet wrap for my bridal bouquet and it truly added such a sweet touch," Morgan said. This special detail made her bridal bouquet unique, unforgettable and truly extraordinary! 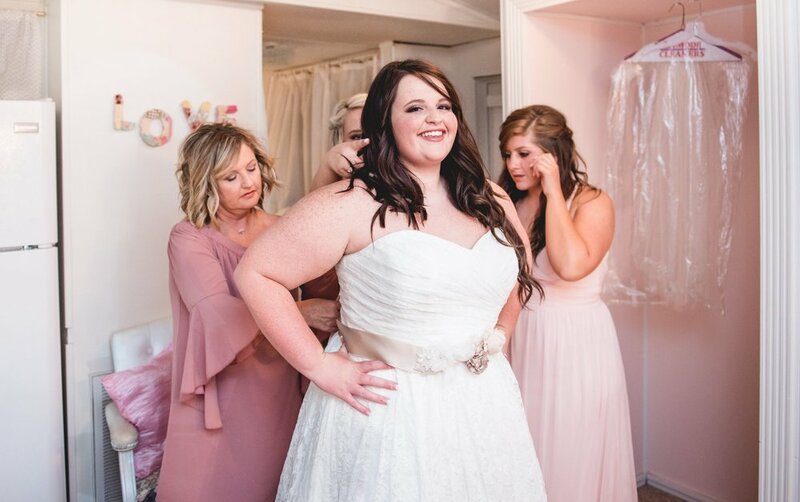 Morgan's pretty dress came from David's Bridal, and we are swooning over every detail - the simple silhouette, gorgeous lace, flattering neckline, fun sash, and her veil with the sweetest scalloped edges. "I wore my favorite pair of authentic turquoise earrings and my cowboy boots to complete my wedding dress," Morgan said. This beautiful bride is the real deal, y'all! Every western bride needs a piece of turquoise and a great pair of boots! Blush pink, long bridesmaids dresses never, ever get old, and these from David's Bridal were SO pretty. These girls were elegant and fun, and they also kept things country with some sweet boots on their feet! The guys wore blue jeans, light blue button-ups, boots, and shotgun shell boutonnieres. The perfect look for a western wedding! Morgan and Hadley shared a first look before their ceremony, and it was truly the most precious thing ever. Hadley was so happy to see his beautiful bride, and we can't get over how these two look at each other! 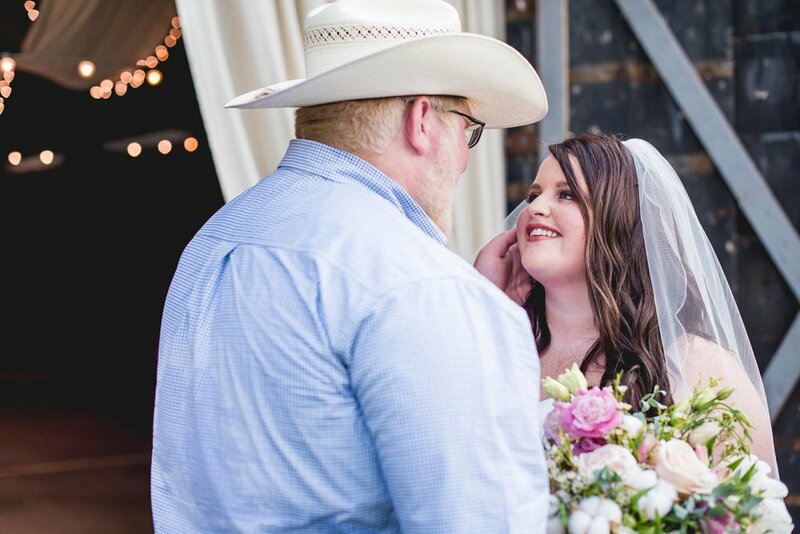 Morgan and Hadley tied the knot out on the lawn in front of The Barn, and it was so full of western goodness. Their altar was made of white-washed pallets, rusty tin and a burlap drape. There were hay bales, a cowhide rug, horseshoes, pink florals and burlap-wrapped mason jars. My favorite detail was the monogrammed hay bale! 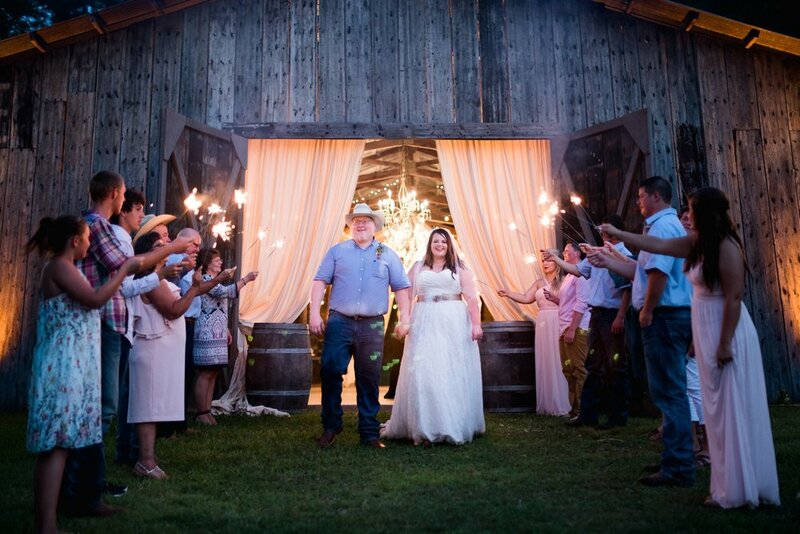 Their ranch-inspired details fit so perfectly into the surroundings of the Twin Oaks Ranch! There has never been a more perfect wedding for this place! "There’s almost too many favorite details to pick, but I loved the wagon that Lesleigh decorated for our son to get pulled down in before I walked down the aisle," Morgan said. "It was the perfect touch! Also the chair that she incorporated for my late grandmother who passed the week before. To have her honored on the front row was so special for us." Seriously though. This wagon! So so cute. Our elopement collections include a cake cutting, and we made sure Morgan and Hadley had a cake that was as unique as the rest of their details! Lesleigh asked the decorators at Kneading Hands to recreate Morgan's leather bouquet wrap on their cake. And it turned out AMAZING! Seriously the most unique cake ever. The pink flowers and pops of blue thistle made this cake extra special. And of course we stuck it on a wooden crate on top of a rustic barrel, because that's just what you do for a ranch-inspired cake display! Morgan's most unforgettable moment from her wedding day was a really precious one during their reception. "It felt like from the time we got there until the time we left, the two hours flew by," she said. "But the second I got on that dance floor with my husband and we two-stepped to 'When I Said I Do' by Clint Black, time just stood still completely. It was most definitely my favorite moment from our wedding." Morgan and Hadley haven't gone on their honeymoon just yet, but they plan to go on a cruise to Grand Cayman, Jamaica and Cozumel in Februrary!